The vehicles we drive today have a braking system that consists of many delicate components. One such component is the master brake cylinder, which works in tandem with the brake calipers, rotors, and brake pads to help stop your car. The master brake cylinder will use brake fluid and the concept of hydraulics to create enough pressure to press the brake calipers. Without a proper working master brake cylinder, your brakes will not function at full capacity. The master brake cylinder works by pushing a piston through a cylinder. The piston compresses the brake fluid and creates pressure. The pedal under your foot is connected directly with this piston, so when you press it the piston multiplies the force and applies it onto the calipers. A failing brake cylinder will create a number of problems for your ride, which will show in the form of symptoms. These symptoms alert you, so you can schedule an appointment with the mechanic and get your problems fixed. The brake pedal is directly associated with the master brake cylinder, so if the brake cylinder fails, you will feel the effect in your foot. The master cylinder increases the force you apply multiple folds, so you don’t have to press hard on the brakes every time to make your car stop. In older cars, this system was non-existent and so drivers had to press very hard on the brake pedal to create enough force for the braking system to activate. A failing master cylinder will thus soften up your brake pedal to an extent where it feels spongy. The master cylinder is full with brake fluid that it receives from the brake fluid container found in the engine bay. 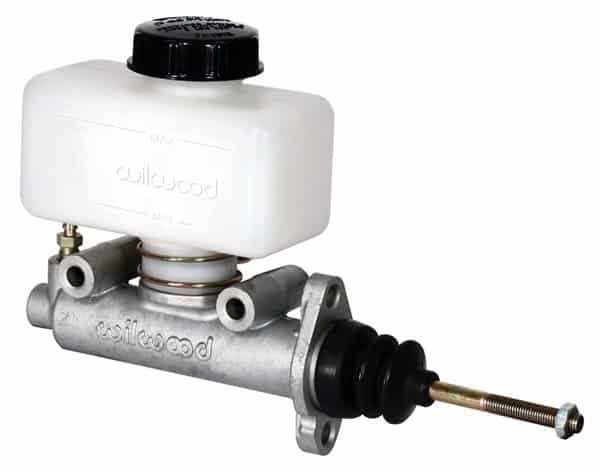 The master cylinder is sealed with rubber gaskets restricting the fluid from leaking. However, the rubber has a certain lifespan after which it starts to break away and deteriorate. The rubber fragments that break away get mixed up with the brake fluid, contaminating it in the process. You will probably see small black sediments in your brake fluid container once you open the brake fluid container in the engine bay. Furthermore, a broken seal will cause the fluid to leak, which will disable the functions of a master cylinder. Modern cars are a work of art. Literally, so many small and large components come together to ensure you get a trouble-free ride. The brake fluid pressure sensor is one such sensor that calculates the integrity of the pressure building up in the master cylinder. If there is any compromise in the pressure level, the sensor will trigger the ECU which will illuminate the Check Engine Light in your dash. The first step to ensure nothing further goes wrong is to visit the nearest certified mechanic. The best way to improve the functions of a mechanical component is to clean it properly, especially when the part is contaminated. The master cylinder, as mentioned above, can get contaminated by a deteriorating rubber seal. To clean it you need an arsenal of a few important tools. Removing the cylinder is the tricky part since it is located deep in the engine bay, so you have to dive under the car to remove it. Normally, this job is better suited for a mechanic. And let’s face it, you are nowhere near qualified to even jack up the car safely. Therefore, leave this kind of work for a mechanic. If you can get hold of one, ask him to hand you the master cylinder. This way you can clean the master cylinder yourself very thoroughly. The Aerosol cleaner is easily available in an automobile shop. First, disassemble the cylinder and separate all the parts. Clean the parts with aerosol cleaner thoroughly so as to not miss any nook or cranny. Leave the parts to dry in the sun before you attach them back together. Also, don’t forget to add a new rubber seal for protection. To reinstall, repeat the process you adopted when you were removing the component, or ask a mechanic to do this work for you. There is not much to be done regarding repairs in a master brake cylinder. Usually, it is the rubber seal that fails, which is normal. The rubber seal cannot be repaired so it has to be replaced. However, if there is any issue regarding a leak or poor performance of the metal piston, a mechanic can help you out. He will have to remove the master cylinder and take a look at its condition before making any judgment on the price he will charge you. It is entirely possible that the master brake cylinder deteriorates to such an extent that it goes beyond repair. This is possible due to a broken piston, or inadequacy of brake fluid. Therefore, it is extremely important for you to be gentle with your brakes and it is highly advisable to inspect your car’s brake fluid every once in a while. When it comes to a new cylinder, prices can be high but the cost you incur will be directly proportional to your car’s make and model as well as the part’s availability. If any of the latter is out of the ordinary, you are bound to pay more. Normally, a new master brake cylinder costs $120 – $200. However, that is not the whole story. In actuality, you have to pay the mechanic for his hard work. The cost he charges you depend on his capabilities. If he is a certified mechanic then he has earned the right to charge you exorbitant amounts. However, if your mechanic is trained through experience, you can negotiate the price to suit your pocket. Though on average. You could be charged $80 – $100 in labor costs.